The great comedian George Burns once said, “If you ask what is the single most important key to longevity, I would have to say it is avoiding worry, stress and tension. And if you didn’t ask me, I’d still have to say it.” As Mr. Burns lived to the age of 100, he likely took his own advice. Finding simple and useful ways to manage stress can make a big difference on our health and quality of life. That’s why we invite you to watch this short video from Simple Truths, which will teach you 10 ways that you can simplify your life. 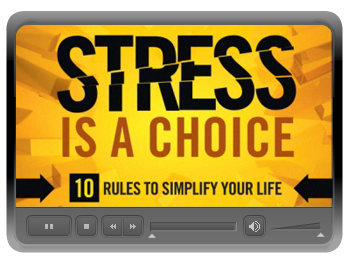 As the video attests, “Life is a series of choices and YOU can choose LESS stress.” Starting right now.